The handicap stair lift is either pad or chair for you to stand or sit on, attached to rail or track on your stairway. It is designed to carry people or items up and down the stairs with the use of a control. Although usually intended with people in mind, any heavy objects like groceries or luggage can also be placed on a stairlift. 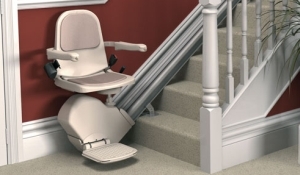 Most stair lifts are capable of handling 300lbs but some can handle up to 400lbs. Handicap stairlifts may be a potential solution for curved staircases too if you have a landing spot. All you need to do is divide the sections in two and pay less for two straight stair lifts than one curved stairlift. The reason for the cheaper and lower costs in comparison is due to the complicated process of customizing the stairlift to meet the exact measurements. A handicap stairlift has prices that range from $2000 to $4000 depending the model and configurations while a curved stairlift may cost $7000 to $15000. Medicaid unlike Medicare may pay for some of your stair lift costs. This is dependent on the stair lift supplier and if the doctor deems you a suitable candidate. Contact a stair lift dealer and see if they accept Medicaid. You must get approval from a participating vendor and let them take care of the billing. Make sure you do not get billed later in the future if medicaid refuses their claim. This can be done in a contract. There are also government programs within your area that can offer loans to assist you in your purchase of a stairlift. Since straight stairlifts do not require too much customization and can be mass manufactured, the installation and availability times are quick. You will not have to wait weeks for someone to design a stairlift to fit your staircase. A stairlift can be delivered and installed in your home within a day, usually a few hours. The longest time spent is one the planning, measuring and deciding which side to place the stairlift. Before installing anything, check for spacing at both landing points. Confirm that you have enough space to get on and exit off the lift. Measure everything twice, the length, width, and make sure the lift is not too high off the ground. If you live in an area with frequent power outs, get a model that has a battery backup feature. Any handicap stair lifts that run on AC power (electrical outlet) only will not work when there is a black out. In an emergency, this battery feature could mean life or death.